I’m sitting in a coffee shop. On the bulletin board a poster encourages recycling to eradicate poverty. Just the other day, I was at a different coffee shop dedicated to the mission of global peace. When I encounter such posters or missions, I find myself overtly skeptical, and I wonder at myself. “Why am I so dismissive of projects like recycling to eradicate poverty, or global peace?” I have to ask myself if I’m somehow opposed to recycling, or unconcerned for the poor, or even the idea of global peace. And the honest answer is that I’m not. I do recycle. I give to the poor. I want global peace. At the same time, why do I find myself instantly skeptical? The central issue for me is over-simplification of the problem. What is the problem? Well, the impression I gather from posters, essays, and people with whom I dialogue regarding this, see the world not getting along–in tension or turmoil. That’s the issue. At it’s core, the world, nation-states, cultures, people groups, etc.–they just don’t get along. The solution: get along–peace. It seems the movements answer to global conflict, is peace. And I don’t see it that way. I don’t think peace is the answer. To view peace as the solution, is to say that we all really just need is just to get along. Now, I’m not accusing advocates of world peace as seeing the world like PolyAnna. No, they understand that conflict is complicated. The Middle East hasn’t seen peace in centuries. They can’t deny it, and I don’t think they do. But I see the problem not so much as one of actions–getting along, as much as a problem of the heart. The Bible says that mankind is not perfect. In fact, one translation describes mankind as “desperately wicked,” and another “beyond cure” (Jeremiah 17.9 KJV, NIV). Ick! As a believer in Christ, I see the primary obstacle to global peace not so much as our actions, but as our very selves. The problem is inside us. Put another way, we are the problem. If the obstacle to global peace is conflict and fighting, and those fights begin in our own hearts, I’m sorry to say, but that means it’s not going to change. Being wicked, sick, or deceitful in our core, is how Scripture describes our very nature. It’s not something that can change, at least not by our effort. How’s that for irony? We are the very obstacle between us and the solution. Just thinking about that gets me down. Is world peace even possible then? Yes. But it won’t happen by getting along, increasing tolerance, raising awareness, or even education. But Lo! There is a remedy. And that’s the good news. There is a solution to the problem. 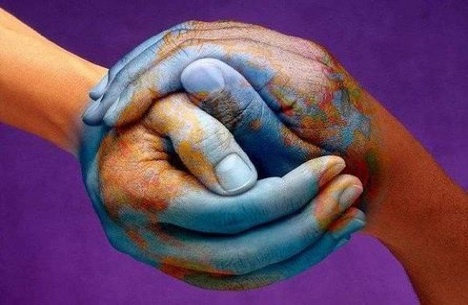 The world can live in harmony with one another. It’s just that we are not part of the solution. Clearly we cannot be part of the solution. We are the problem. The answer is Christ. He can purify our hearts and make us clean (1 John 1.9). Scripture also discusses how He is the only one who can fix the problem. And just in case you’re wondering, “Maybe it’s Him plus me”, Scripture is quite clear to point out that we can in no way accomplish this of our own effort (Ephesians 2:9). World peace? Yes. Eventually, just not yet. One day every knee will bow and every tongue will confess that Christ is Lord. That’s gonna happen. Bank on it. That is what world peace will look like–when every living soul submits to the sovereign authority of Jesus Christ (Romans 14.11). I don’t think it’s going to look like heads of state laying aside their differences while the people they represent put down their RPG’s to take up hand-holding. I believe the world will one day be at peace. It just won’t look like that. Why am I skeptical about world peace organizations? It’s not that I’m not on board with the vision. It’s more that I disagree with the means. Where the means constitutes right action, that method is fundamentally flawed. Unless we seek peace by furthering the gospel–that nations of people make peace with God first, peace between persons or nations by extension won’t happen. Can’t even. Is world peace worth pursuing? Yes. Scripture also says believers are to live at peace among men, as far as possible (Romans 12.18). Conflict resolution, especially between nations, is absolutely wonderful. We should pursue it. As an American, I want my country to pursue it. At the same time, I don’t want to delude myself about the ends of those means–that we can accomplish it by any effort of our own. I want a world at peace. I look forward to it. I just don’t want to dupe myself into believing that I can bring that about by my efforts, or the efforts of anyone else. That would deny the complexity of the problem and the solution God has provided through Jesus Christ. That’s the gospel. And I’m not about to deny that.